NOTE : many of these reports are from the pre switchover low power digital + analogue era, but that doesn`t make them any less relevant as regards aerial performance. In fact aerial performance was actually assessed better when using analogue signals. I`m very interested to hear how well our aerials work, particularly when compared to another antenna (e.g. your old one) and I feel this is also of interest to others, so here are reports [mainly from our customers] filed by model of aerial. Basically the aerial`s great! Some background. I'm a competent DIYer, but put a new TV aerial up about 5 years ago which turned out to be a waste of money. I didn't realise what a difference in quality there could be, and only looked at what was available at DIY superstores. I used a good quality pole, good quality bracket, good quality cable, but was taken in by the claims on the "Bacofoil” aerial`s box ! The house in question is in a valley, next to the Peak Forest Canal, just a couple of miles from the Romiley mast, but I would need to aim the aerial through the canal bank to reach that mast ! We are about 36Km (or 22miles in real money) from Winter Hill and use a cheap EchoStar Digibox. The mux carrying BBC1 etc showed a strength of 7 or 8, but the other muxes only gave 3 or 4 and were blocky, and when I re-turned it might find or lose some channels depending on the atmospheric conditions ! Sometimes 36 channels, sometimes 81. I spent hours on several occasions reading your wonderful website, trying to educate myself (a losing battle at the best of times ! ). I decided I had to choose between the Yagi 18 C/D and the DY14WB. I was concerned that the wind resistance of the DY14WB might be worse on top of my 8' pole, but your graph was the thing that helped me make the final choice of DY14WB. I assembled the aerial with new cable indoors until we got some decent weather ! I also used cable-ties sticking out all over to dissuade our local wood pigeons from using the aerial as a launch-pad. They now tap-dance on the roof above our bed to let us know just how annoyed they are ! When I came to erect the new aerial in pride of place, I haven't got a meter, so I aimed the aerial generally in the right direction, re-tuned the receiver, and all muxes now gave a strength of between 7 and 9 ! I tried swivelling the aerial to find where the signal dropped, because I'm certain we don't have line-of-sight. I found that I could move the aerial about 15 degrees to the West or 15 degrees to the East with only a slight drop in signal strength. As a result, I aimed the aerial roughly at the mid-point, at the lowest gap between hills and trees that I could see, and left it at that. You're probably bored-stiff by now, but one final thing to say – when I removed the 5 year old aerial I found that one of the elements had dropped off, and was lying on the roof ! The others were mostly bent. The DY14WB is so much stronger I can't imagine having any problems like that ! Once again, thanks for your help (via the website), and I hope your business goes from strength to strength. Before I bought any aerials from you I also tried a couple of other so-called high gain aerials from Argos and Maplins but neither of them was anywhere near as good as the Yagi18CD or the DY14. I tried the 18CD first and it was significantly better than existing aerial but still not perfect. I then swapped it for the DY14WB and the difference is brilliant. I have it set up in my loft (due to local restrictions) with a mast-head amp turned up to maximum gain, but I can now receive Mux 1 (BBC channels) which I couldn't before, and Mux 2 (ITV channels) which pixellate from time to time but at least I can get them now. I have also found that Analogue reception is better than my old aerial that points towards Newhaven. Thanks for all your help and advice My original aerial is now completely redundant and, as the DY14 has proved so good, I’ve had to drop a couple of cables from it into my kids bedrooms. Like you, I was really surprised at how good the DY14 was after my experiences with the other aerials so your recommendation was well founded. Just a quick line to say thanks for your advice and help; I now have the new setup running. We use a Humax PVR which has a signal %, using this with the DY14WB we seemed to have gained 1% over the existing DAT75 (this is a "Tri Boom aerial") although this could have been a number of things ; The DAT75 was approx 4 foot higher and we`ve reduced cable run by 10m due to new location. So overall things seem comparable but given the smaller size of the DY14 we were impressed with the performance. The installation is also rock solid which is a lot better.... just need to pluck up the courage to get up to the chimney and remove the old setup! Many thanks. Firstly a big thank you to you or whoever wrote your website. So much useful information. I never knew that despite having line-of-site to the Mendip Mast only 7 miles away, the inside of my loft could be a 'weak' signal area. I also never knew that combiner/splitters took a few dB off the signal unless they were diplexers. This aerial upgrade was prompted by inability to receive the ITV/Channel 4 multiplex on Channel 55. I was getting 3/10 for signal quality - some days enough, some days not. All the others were 9/10 in spite of the crappy 12 element Contract aerial. Now that the DY14WB is up there I get 6/10 on Channel 55 and 10/10 on all the others. I'm led to believe that Channel 55 will be stronger after switchover but that is not until next year. In the meantime, I now have perfect picture and sound on all channels so a job well done and money well spent. Cheers. Placed my order for the DY14 wideband aerial on Friday 15th May, it arrived by TNT on Monday 18th May 2009. Was installed in my loftby 3.00 pm the same day. I live 18 miles from the Ridge Hill transmitter which is South East of Hereford. I had agonised over putting the aerial in the loft, but having carefully read your excellent web page, I decided to give it a go, with your recommended DY14WB aerial. I also went for this aerial as it is relatively short in physical length for fitting in my loft. Also it covered the current digital aerial configuration and would accommodate the revised configuration once the digital switchover takes place late 2011. I assembled the aerial as per the instructions on the aerial box - no problems arose I used the compass bearing of the Ridge Hill transmitter from my home. Following the advice on your 'Home' page I located the 'Sweet spot'/ best physical location in my loft and installed the aerial. I was concerned that the directional set up meant that the aerial would be receiving its signal directly through the gable end wall of the house. However, it still worked fine. Using an amplifier it feeds Freeview to three TV's in the house, all having very good pictures. Kind regards. The XB22WB is no longer available, these reports are on here for purely historical interest. We now recommend the DY14WB in place of the XB22WB, to be frank the difference in gain is not great anyway. The new aerial works significantly better than the old one (which I think was an XB10 wideband) though I did change the cable and the Mast Head amp at the same time, so we cannot be sure about the relative impact of each ! We are in a pretty poor reception area. The XB10WB we had before was an improvement on our old aerial but the signal was still glitching every now and again, worse on some channels. We then then swapped the XB10WB for the XB22WB and did experience an improvement, but it`s still not perfect. So an aerial upgrade was still necessary even if only to save me from an ear bashing from my wife. Given the history of my incompetence to date I decided more research was necessary and fortunately I found the ATV website. I started reading the website, and much knowledge was gained. With my newly gained know how I knew what to order and more importantly I understood why. A DY14WB and mast head amp was ordered on Wednesday lunchtime and arrived Thursday afternoon. I put the aerial together and replaced the tri-boom. Then into the living room in great excitement to see what improvements had been made. Although the aerial did pick up Mux 5, an improvement over the previous one, it did not pick up Mux 2 (remember though that this is on channel 68). As for analogue, BBC 2 seemed ok, but C5 was still noisy. Nothing for it but to install the mast head amp. Bingo ! Analogue C5 was now noise free, and BBC2 looked good. Scan for more channels, and all 6 Muxes are there, all showing 95%+ sig strength and most showing 100% sig quality, except Mux 2 which was nearer 75% quality. This could be why I don't seem to have all the TV channels showing that are allegedly available on this Mux. I don't really care, why would I want E4, but junior SWMBO (she who must be obeyed) has already given me grief over this. The DY14WB picked up mux5 (on CH54) which neither of the other aerials would but didn`t show sufficient improvement to make a significant difference on the other 5 muxes. With the Masthead Amplifier installed it is now possible to receive all channels from 35 (C5) all the way through to 68 (Mux 2). So all in all money and time well spent. Only one regret, I wish I'd found the ATV website a lot sooner as it would have saved me time and money. Sudbury could be problematic for digital reception (pre DSO) due to its restricted radiation pattern. Ordered a new DY14WB (for my Dad) from you on Monday, it arrived Tues, and was fitted Wed. Wall fixing kit superb, aerial awesome. We put the new aerial on the end of the house because this neatly allows a line of sight past the neighbouring trees and somewhere out in the distance is Waltham SE about 25 miles away. I went with the DY14WB because even though we`ve line of sight to the transmitter, and ought to be great in the area, everyone around my parents has had some problems. 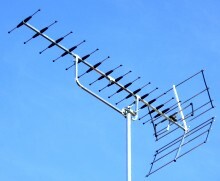 Lots of people around my parents have had new aerials fitted but the prices are mostly in excess of £200. I though most of the aerials fitted round here were similar to the DY14, but when I had it up (the aerial that is) you could see the difference in quality even from the ground. It`s a much more solid looking piece of kit. I think it will probably be overkill in the long term but until late 2011 when changeover is complete it is what is needed. My Dad is 82, so the end of 2011 is a long wait when you’re his age!! Finally he can press the red button and get a picture ! Also found that there are about 25 other digital channels he has never seen before. Thank you for great information and products and service. My own aerial was replaced a couple of years back with one of your Log40s, I get an awesome picture and I’m picking up Emley Moor from York. Thank you for your prompt delivery of the two aerials that I ordered at the end of July . The aerials have now been installed and I can report that they are working well. The original aerials for Hannington was a 20 element Group C/D Yagi (18 directors, a folded dipole without balun and a plate reflector) of 1984 vintage.This has been replaced by your DY14WB aerial. The signal received from the DY (measured with a spectrum analyser on the vision carriers) increased by an average of 2.2dB over the five Hannington analogue frequencies, with a range of +1 to +3dB. I have to use Crystal Palace for DTT because Hannington doesn't provide much Digital signal to the East in my direction as it would interfere with some of the channels used by the relay at Guildford. The build quality of both aerials was good and the bracketry etc looked like it will stand the test of time. Also see the aerial report for the XB10A (on Crystal Palace) at the same site. Our old aerial was a Contract 18, possibly a wideband, though to be fair the installation has to point through trees. Not all the digital could be received and the analogue was very poor. Having replaced the contract with the DY14WB (and changed the cable) the digital is now good on all the channels. The analogue is much better but it`s still not perfect. This is a poor reception area as demonstrated by the fact that the analogue picture is still a bit snowy even with the XB22. The digital signal is now fine though, with very little freezing or pixellation. The installer who I got in to fit the aerial didn`t change the cable, which I now realise he should have done. Had he renewed the cable I may well have got a an even more improved picture. The cable should be always be changed when the aerial is replaced, unless it is good quality cable (i.e.satellite grade) and it`s definitely in perfect condition. Unless this installer had a severe access problems, which the customer said he hadn`t, then I think we can conclude he`s a bit of a bodger. At least we know that any signal improvement was just down to the aerial, since it used the same cable as the old one ! We live in a dip so have never had perfect signals despite having the aerial on a high mast. The previous aerial was a 10 element A group and we got reasonable analogue but it didn`t receive much in the way of the digital services. With the XB22WB we now get good digital, MUX1 is the worst but it`s still watchable, and the analogue is also slightly better than with the old aerial. The cable was changed at the same time as the aerial, it was cheap stuff but still in reasonable condition, and we also improved the quality of the splitter we were using. The reception in our low down locality has never been particularly good, possibly because we`re 25 miles from Sudbury and the analogue transmitter is directly in line with the digital one behind it ! Our old aerial was a Contract 10 B group on which the analogue was reasonable on BBC2, ITV and C4 but poor on BBC1. C5 was bad, although it is on low power. Digital was sometimes OK but mostly it was unwatchable. With the XB22WB the analogue is now fine apart from C5 which is reasonable but not perfect. Digital is fine. One slight criticism, I wasn`t convinced by how waterproof the rubber boot over the F connector connection into the aerial was/would remain, so I used self amalgamating tape and silicone on it just to be sure. Belt and braces probably but I`d rather be sure. I must confess that I also prefer the conventional connection within the dipole box, and whenever the manufacturers give the option for either we specify that. This doesn`t apply to Log Periodics where the F Conn is usually within a weatherproof cover. Unfortunately the XB22WB aerial is only available with an F conn fitting. We did change the cable at the same time as the aerial, but the old stuff was in reasonable condition so whilst I think it will have made a bit of a difference I think most of the improvement is down to the XB22WB aerial. Interestingly there was one cable run, of the old cable, which we couldn`t change because it was buried in the wall. This became quite significant when we realised that our central heating was causing interference on the digital signal, because it only affects the TV on that run of cable. All the other TVs, where the cable has been upgraded are fine ! It`s worth using decent quality cable, definitely. I`m delighted with the aerial, it`s made a world of difference, and your website was so useful I`ve put a few others onto it ! Good to see the Mk2 wideband works as well as the Mk1. We had a lot of trouble sourcing a replacement aerial when the Mk1 was discontinued. In fact we ended up getting an equivalent aerial manufactured specially for us. I then had to test the prototype 2 or 3 times (including using an alternative dipole) till it was OK. The gain curve is slightly different to the Mk1, but the average gain per group is almost exactly the same.